Tech of the Week profiles IT professionals, highlighting the challenges they face and the tools they use to meet them. This week we talked to Brian Fulmer, a networking specialist working for a diversified construction and manufacturing company in Visalia, California. Fulmer resides in California’s Central Valley just outside of Sequoia National Park, where he spends weekends “up the hill” hunting deer and enjoying the outdoors with his wife and two sons. 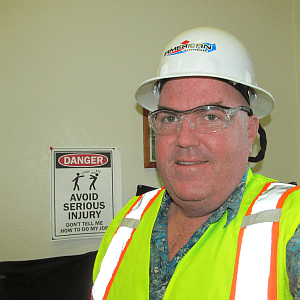 Work-wise, he makes sure construction sites are properly connected so that personnel can effectively communicate with themselves and the Internet with smartphones, tablets, and desktops. Naturally, he tries to do this as cost-effectively as possible. Here is how it makes it work. HardBoiled: You were able to deploy a 40-person WLAN at a remote job site in Central California for $4,500. What kind construction project is that? Brian Fulmer: This is at a hospital construction site. We’re doing the underground plumbing and piping, the medical gas system, and the mechanical (HVAC) side of things. HB: You deployed Ubiquiti access points (APs), controllers and EdgeRouters onsite, but your smart switch is a Netgear. What went into your decision to mix brands? BF: Interoperability is a hallmark of networking gear. If I can’t mix and match with it, I won’t buy it. Looking at you, Cisco! 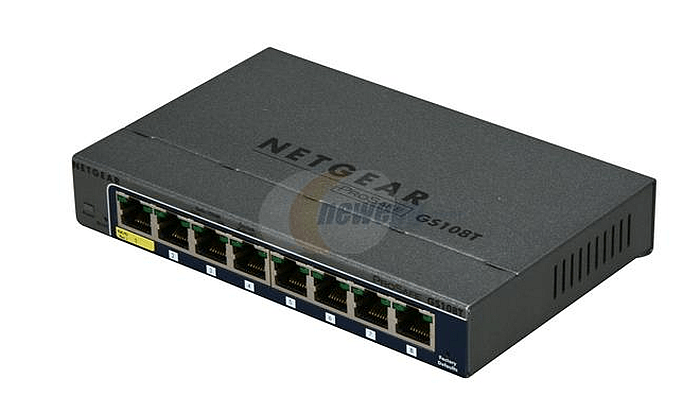 I have a whole bunch of Netgear GS108Ts out and about around the shop. The GS108T is cheap enough and has been very reliable for me to make it a go-to item. I have three on the shelf right now, in fact. The other two job trailers I have right now that are similarly set up are both using HP 1810s, in one case because it’s a huge long-term job ($29M) with five staff and two printers, so the port count needed to be higher, and also because I had it on the shelf already opened. To clarify about the controller, there is only one controller on a virtual machine (VM) in Visalia, and it manages four sites as of today. Very good stuff. HB: I am seeing that Ubiquiti products have gained a good reputation among networking professionals on Spiceworks. What is to like about their APs and routers? BF: I had prior experience with Ubiquiti’s point-to-point bridges–lots of wide open spaces here [to accommodate]. A buddy of mine has a bunch of dairy customers; I helped with setting up the first three links from house to dairy barn back about five years ago. Basically, I set up a recipe with him, and he’s still using the gear today, even in multi-point deployments. Additionally, both major wireless Internet service providers in the area–and I have services from both–use Ubiquiti gear. I actually bought a 3-pack of the UAP ACs from NeweggBusiness, but they just don’t feel “done cooking” to me. I pulled them and went back to UAP Pros. That’s an outstanding business AP. One of the good things about Ubiquiti is they keep working to kill bugs and refine their software/firmware, and then they add features. The UniFi controller software is a good example; I have seen the same progression in the EdgeRouter series. The developers listen to feedback from the community, as well as respond to it. Very weird; reminds me of the Microsoft Technical Beta’s back in the NT days. The little EdgeRouter Lites are really neat; I bought one for my home office from Amazon when I upgraded my Comcast Business to 50 Mbps. Dumped the Comcast “business gateway” and went with a Motorola SurfBoard modem, and the performance is excellent. That testing let me start dropping real routers into job trailers at a minimal cost change from consumer grade units. Much better. A big disappointment to me has been the AirVision/UniFi cameras and software. I bought an AirVision bullet cam and a bunch of others (Dahua, Hikvision, Grandstream) and for the money, the Ubiquiti cameras weren’t even close to good enough. I’m rolling another 38 cameras out after our nine camera test deployment (in fact I’m dropping in an HP V1910-8G PoE switch to an outbuilding today) and I am glad I do a bake-off for projects like this. I do use the Ubiquiti camera for my office, so it wasn’t money misspent. HB: You also did a staged integration project for a refrigeration company. There, your users have Lenovo desktops in the office and use iPads out in the field. BF: Lenovo, HP and Dell are all desktops and notebooks I use. Business grade machines are very similar in quality and cost, so I tend to buy for other factors, like what’s on sale at the moment. It’s not like I’m buying good beer. I shop the sales for the three or four machines I buy at a time, generally speaking. HB: Do you run into trouble with mixing OS in your environment? BF: It’s more a matter of mixed workloads and using the appropriate tool for the job. I get requests to use tablets for things they simply aren’t capable of, which is understandable. I had a plumbing project manager ask me the other day if he could use his iPad to write POs. Our enterprise resource planning (ERP) system is very keyboard oriented. I explained the gap in the capability of the tablet versus the requirements of the software and he understood that it was best to keep using his notebook even in the field, and accessed through a remote desktop session (RDS) on the RDS server. That said, he made himself a candidate for a Surface Pro 3, of which I’ve deployed a half-dozen to unanimous approval. HB: How do the iPads handle the Windows Server 2012 environment? BF: I’m actually using a 2012 MacMini with Server 3.0 on it to deploy the MDM policies to the devices (like PIN reset and remote wipe, limit App Store to G-rated, et cetera) while additionally registering the device to the users ActiveDirectory account. It works reasonably well, and at least gives me an inventory and basic status information. I’ve been very pleased with the durability and surprised at the longevity of the Otterbox/iPad combo, given the service guys beat hell out of the trucks. 60-plus iPads, and two years later, only one lost to theft, none to damage. The Samsung Android tablets have worked fine for the limited tasks they’re asked to do, but the lack of a radio modem (4G LTE, for example) has relegated them to secondary duties. HB: Thanks for taking the time to talk shop with us, Brian. Best of luck out there in the field on future networking and IT projects.